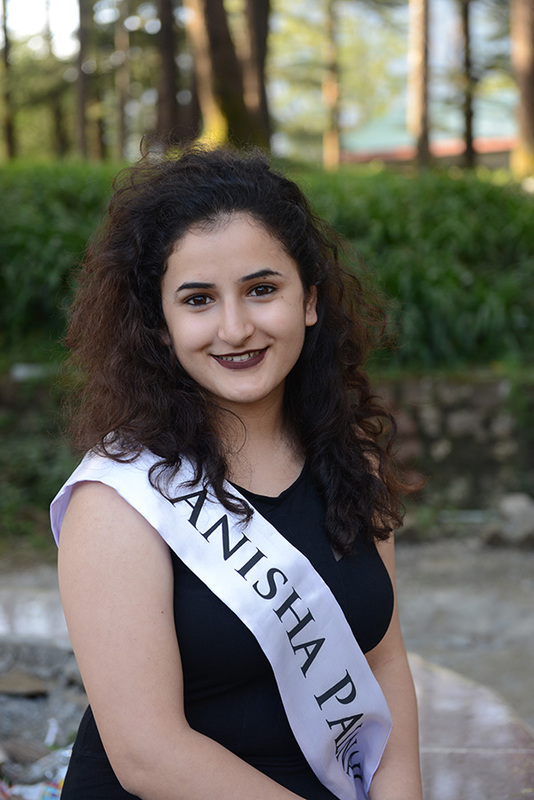 Anisha Palnail is from Darnu, Upper Barol, Dharamshala, Himachal Pradesh. She is studying as an undergraduate, and also works for a tourism company. She speaks Hindi and English. Born 16 March 1999, and 165 cm tall. My ultimate goal in life is to serve my country and be a part of its betterment, I want to be an IAS officer, which I rarely discuss with anyone. My current goal is to achieve all that I am participating in. Himalayan culture consists of Hindus and Tibetans, and the beautiful Himalayas are what unites us. Himalayan culture and tradition is quite different from that in other parts of the country, Himalayans are introverted extroverts, which means they are not very frank and and a little bit reserved, but once you'll visit therir place they will welcome and treat you like a family member or an old friend. Himalayan people mostly wear woollen clothes, and in some regions there are transhumance as well. In some of the regions of Himalayas winters are at an extreme level, but mostly weather at these places is pleasant and beautiful, which attracts tourists from different countries. There are many places in the Himalayan regions which are very beautiful but unexplored, likewise there are many people who are talented but undiscovered.